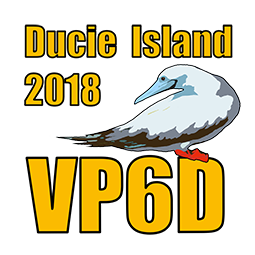 VP6D - Ducie Island QSL card’s were mailed on Monday, Feb 4, 2019 from the United Kingdom. The mailing included all OQRS and Direct Mail confirmation requests received by this mailing. Also included were cards shipped to foundations / clubs for distribution. Subsequent mailings will occur on a regular basis. Buro cards will be shipped to the worldwide buros at a later date. Please allow sufficient mail time before inquiring about missing cards. VP6D QSL card designs were completed, proofs were submitted and approved for printing. Gennady UX5UO printed the cards during the week of Jan 7th, they will be shipped to Tim M0URX in the UK during the week of Jan 14th. A separate /MM card was also designed. Tim has already prepared the mailing labels, the envelopes are waiting to receive your cards. All confirmation requests received up to the mailing date will be included in the mailing. Confirmation requests after the first mailing will be processed on a regular basis. We expect to place the cards in the mail system by early February. The cards will be mailed from the United Kingdom, so please allow for mail system delays before asking for the status of your card(s). Buro cards will be mailed to the world buros quarterly, expect 6 – 12 months, or more, to receive buro cards. If you already requested confirmation via OQRS or by direct mail, our system will not allow duplicate requests. For example requesting a buro card more than once, or requesting a buro card if a card was sent via Direct Mail. We will send another update when the cards are placed into the mail system. We are just about finished designing the the VP6D QSL card. It will soon be sent to the printer and then to our mailing team in the UK. LoTW for all donors and those who processed OQRS for Direct Mail confirmation have been uploaded to LoTW and will continue to be uploaded for all new donors or OQRS submissions. Interestingly, there was a group of tourists who didn't understand amateur radio activities.I think it was also a good propaganda. VP6D and a Coat hanger? Mike KJ4Z posted this picture of a friend's antenna used to work VP6D. Note the plastic coat hanger insulator. Good job on the expedition, looks like it was a lot of fun! Here's a picture of my working conditions. I suppose my real RST would be something like 229 or 339 but K3EL hears incredibly well and kindly gave me a 599. A couple minutes later it was all packed away on a shelf in our condo here, just in time to read the message on DXA saying I had made a QSO.